I have a friend who coaches Extras soccer for AYSO, and who has been through the club process with his oldest daughter. In spring of last year, I approached my friend for advice in finding a new team for my son, who had completed his first year of club soccer as a goalkeeper. I asked my friend if in selecting a coach, I needed to be concerned about finding one that believed in playing from the back, and who would give my son plenty of experience with the backpass. His answered surprised me. He noted my son had played for a year with the new experiment, known as the build-out line, and that it was unlikely that coaches would ever go back to playing long balls once that line was removed, so I shouldn’t lose too much sleep over it. I was skeptical, and offered to buy him a round if he was right. Sadly, I think he lost that bet. In 2015, U.S. Soccer began to roll out a series of reforms, called the Player Development Initiatives. One modification that the PDI’s made to the U10 and under game was to implement a “build-out line”. On goal kicks, or if the goalkeeper has the ball in his or her hands, the team not in possession must withdraw past this line (located at roughly the back third of the field). The team that is not in possession cannot reenter this area until the team in possession has put the ball back in play, in the case of a goal kick by kicking it out of the penalty area. As a parent of a goalkeeper, and sometimes AYSO and club referee, I‘ve heard various comments by parents about the build-out line. Some people love the build-out line, some people hate it. Some people find it unduly complicated, and some people think it’s just silly. I’ve heard more than one parent say “just let them play”, and more than one recreation referee be intimidated by the complexity. I’ll admit myself to being an early skeptic. But the intent of the build-out line, in the words of U.S. Soccer, is to promote “playing from the back in a less pressured setting.” U.S. Soccer wants young players to learn to move the ball from goalkeeper through the defenders, and gradually learn to build up an attack through the passing game. For that reason as well, they prohibited goalkeepers from using the drop kick or punt in U10. For the age groups for which the build-out line is in place, from my experience at least coaches do seem to have to try and make an effort to build from the back. My own goalkeeper son’s first club coach went from telling me his kicks were too weak to risk losing the ball near the goal when no build-out line was in place, to having him take every goal kick because the build-out line eased the pressure on team and having a defender make the kick removed a player who could receive the kick from the field. But I’ve also seen too many coaches have the goalkeeper pass it to the big-legged defender and then have that defender just “send it”. More concerning, once the build-out line has been removed, I’ve seen too many teams go back to old habits of punting the ball or long-balling the goal kick, whether through watching my son and his competitors, or while I’ve been refereeing a game (whether club or AYSO). Look, I get it. Particularly before the build-out line was implemented a few years back, goal kicks were the bane of every youth soccer coach’s existence. Punting and the long goal kick in particular are specialized techniques that can be hard to teach younger children, particularly when they have so much else to learn and practice time is limited. Some coaches, and sadly some coaching resources, even resorted to workarounds, such as having the goalkeeper kick the ball out of the touch line rather than risk losing it too close to the goal. Coaches, whether club or rec, having so much pressure on them to win, simply didn’t want to risk having an unskilled goalkeeper flub the initial pass, or an inexperienced defender lose the ball under pressure, and give up the easy goal. I fear the problem, however, might be about to get a whole lot worse. In March of this year the IFAB approved a series of changes to the Laws of the Game. Before the revisions, Law 16 stated that to be in play, the ball from a goal kick must leave the penalty area or it must be retaken. Under the revision, the goal kick no longer needs to leave the penalty area to be in play (though the opposing team cannot reenter the penalty area until the ball is played) and the defenders can play the ball before it leaves the box. According to the published IFAB Summary of the Main Changes, the purpose of the change is to stop the tactic of wasting time “when a defender deliberately plays the ball before it leaves the penalty area knowing that all that will happen is the goal kick will be retaken.” Too many pro players were in response to teams pressuring their defenders high, or in an attempt to wind down clocks, intentionally touching the ball before it left the penalty area to get themselves out of trouble, and the IFAB felt it had to do something about this to keep the game lively. The revisions, however, were made with the pro game largely in mind, and not the unique needs of young players developing their soccer skills. A clever youth coach will welcome the rule change as providing more opportunities for creative play. Now the goalkeeper can not only pass the ball short to the defenders on the wings, or could play the long ball him or herself, or could pass it to the center back (who in turn can play it long or pass it back to the goalkeeper). There will be the temptation, though, for more panicky coaches to just treat the goal kick like a kickoff: with the goalkeeper tapping the ball short to the big-legged defender, who draws in the opposing team and then uses the rolling ball to kick it long and forward. After all, the ball will be even closer to the goal now than it was when the goalkeeper had to kick it wide to the defenders, and nearer the prime real estate at the center of the penalty area. I can hear the coaches already: “It’s just too close to the goal for us to risk it!” This temptation undermines everything U.S. Soccer has tried to create with the build-out line. 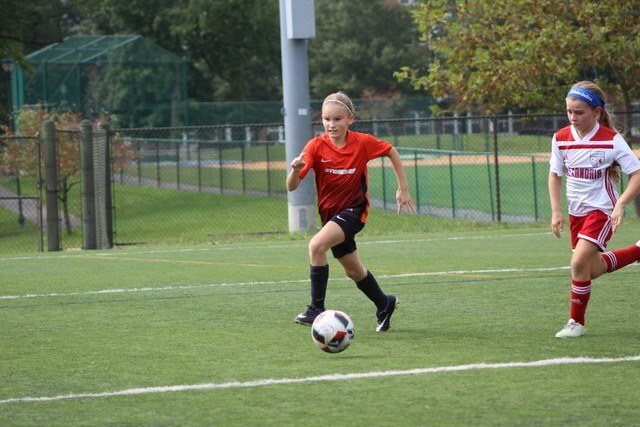 In October 2018 U.S. Soccer formed a special task force, called the Youth Development Task Force, consisting of representatives from the various organizations involved in youth soccer in the United States. The Task Force was formed to look at ways youth soccer in the United States could be improved, in part due to the failure of the USMNT’s failure to qualify for the 2018 World Cup. The Task Force should carefully examine the impact of the new soccer rule on youth player development. I would urge the Task Force to take a series of steps related to the implementation of the new rule. With data in hand, consider and debate whether further youth/U.S.-specific modifications of the Laws of the Game are needed in response, with everything on the table, including expanding the use of the build-out line or altering aspects of the new rule. Implementing a long overdue system of continuing education for coaches, with the benefits of possession-based soccer as one of the topics. My intention with this article is not to debate the merits of the direct v. possession-based soccer. Indeed, in a recent article in Soccer America's Youth Soccer Insider, Beau Dure makes an interesting defense of the long game. But U.S. Soccer clearly set out to do something by creating its build-out line rule, and not only is the effectiveness of such change still out with the jury (and we may not see results for several years to come), the new change by the IFAB to Law 16 also may undermine what U.S. Soccer is trying to accomplish. At a minimum, U.S. Soccer should take steps to study the effectiveness of the build-out line and the impact of the new Law 16 on youth play, and such study should be both comprehensive and statistical, because only with proper data can U.S. Soccer see if its initiatives are doing what they hoped it would. I for one would be more than happy to pay the price of seeing America’s youth coaches be able to play a proper possession-based game: buying my friend a cold one while watching the USMNT play in the 2022 World Cup. Yesenia Torpoco is the proud soccer mom of a goalkeeper, and AYSO and club soccer referee. Why Are Lessons in Humanity Forgotten When It Comes to Referees? I have been assured that the new Law modifications will not affect the Build Out Line for U-10. I hope U.S. Soccer will issue a statement in this regard soon – but I also know that their communications department is stretched very thin and that this could take a while. Hopefully, with additional staff and with a more strategic communications plan – U.S. Soccer will eventually be able to stay ahead of issues like this and more effectively connect with their membership. Yay! At least that’s something, and it’s understandable given how much the IFAB (surprisingly?) dropped this year. The goal kicks revision isn’t even the most impactful of the rules changes to the game. I note, however, that such is not the end of the conversation for U10. The other decision US Soccer will need to make is how the 2 rules (build out line and new Law 16) will interact. Under the former Law 16, the ball was in play when it left the PA, and at least most orgs (though there was some variance form region to region, year to year) said opposing players could cross the build-out line only when the ball was in play and had left the PA. Under the new Law 16, “the ball is in play once the kick is taken”. So if the build-out line rule remains unchanged, it means players can cross the line once it’s been kicked by the goalkeeper. Under the old rule, the intercept point between teams was likely along the wings. Under the new rules, if both remain unchanged, the intercept point will generally be closer to the goal, removing some of the buffer young kids learning to build out the back had. It also doesn’t resolve the impact on U11 and above, but thankfully at least there remains something to work with for U10. I’d expect some degree of confusion among referees regarding these changes (which have fluctuated from year to year) so there will be some growing pains still in the foreseeable future.